People who know me first through my work as a business trainer often comment that I must be the most meticulous, prepared person they know. They are often surprised to hear what my blog buddies know: I am meticulous when it counts, and the rest of the time I fly by the seat of my pants. 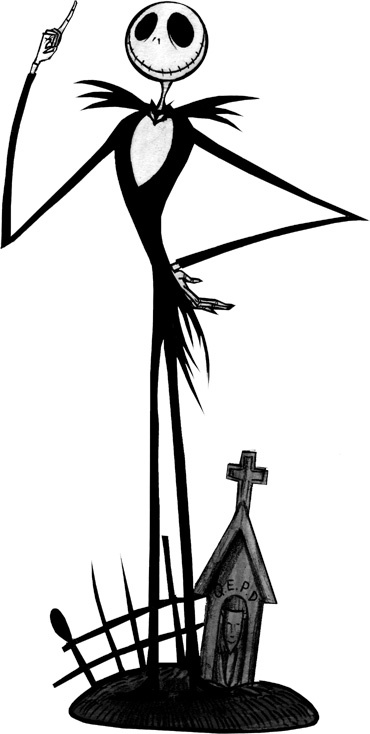 When Louis told me a week before Halloween he wanted to be Jack Skellington from The Nightmare Before Christmas, I jumped on the idea of putting this cool costume together: skinny suit with nipped-in waist, cool bat dickey/ whatever, long coattails, etc. I didn't consider that I'd just come out of a busy and exhausting work and volunteer week, and that I was about to go out of town and return to my sewing machine on Oct. 30. I took a short-sleeved black men's shirt from the stash and hacked away at it, with the help of Simplicity 4760. I cut those "tails" while he was wearing the shirt, and attached them by machine to the collar. Funny how easy my son complied when I asked him to let me take a photo of the coattails. That Ace Ventura instinct to put one's rear end on display is alive and well for him. 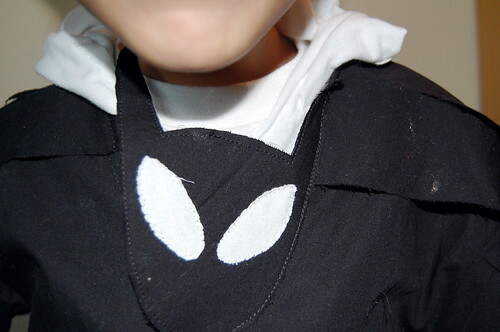 I sewed up a white hood from cotton jersey -- literally draped it on Louis' head, pinching fabric and drawing on it with pencil, and then I sewed it onto the neckline of a plain white t-shirt. Louis had a white night shirt on which we'd freezer paper stenciled Jack's likeness last summer. 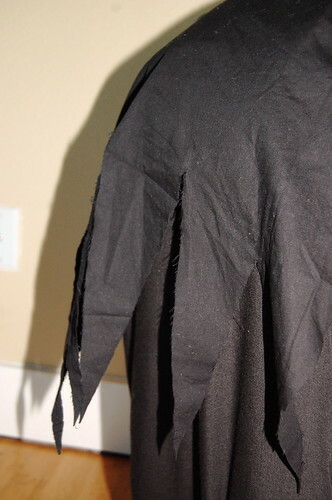 The night shirt was getting small and badly stained, so I just cut the face out and sewed it to the top of the hood, leaving the bottom open so he could lift Jack's face out of the way and see better when he needed to. And don't forget that bat detail! With more time, I would have sewn in boning or done something to make the "batwing collar" stand out more, but I couldn't leave out the bat detail closure at the front neck. We got to the party late, but just in time for cake and an hour of company. I felt like the costume was a total hack job, not worthy of Halloween, but my husband was impressed and my son was happy. So much for meticulous and prepared! "Fly by the seat of my pants" has such a derogatory ring to it. How about the Queen of Improvisation? Maker of Last-Minute Miracles? The Get-It-Done Guru? The costume is fab - if your son was happy, then you did well. Great costume. I did a few night before up til midnight sewing stints when i worked in the CBD. My kids would suddenly tell me that they needed a costume for book week or the hat parade the next day. Always felt like I was winging it, but they worked out in the end. Wow! Great job! I think I would've been too exhausted to do any sewing. I think it turned out great and what really matters is that your son liked it! :) Welcome home! I think it looks really good!! Love that you used the screened on shirt as a mask!!! That's a really great idea!!! Pretty good work for less than one morning's work! If my kid starts wanting Halloween costumes, I'd probably just go to an el cheapo shop for a mask and a cape. The perfect costume for the circumstances! I have no doubt Louis absolutely loved his costume just the way it was. I like to think of improvisation as needing a lot of creativity, flexibility, good fundamentals, and intuition! Meticulous, as you say, has its moments, but isn't a blanket necessity :-). You do a great job on everything you do. Question: Since the Month of tops sewalong is growing I was think about creating a blog dedicated to it like you did for the jackets. I am not sure how to create one to accomodate all of the participants postings??? Can you tell me? @Angela Pea - I like the titles you offered much better! Thanks. @Gail - What miracle workers we can be called on to be when we have a sewing machine! I'm not sure I could stomach this tight turnaround more than once a year! @Wendy - Thanks. I really wanted to make the jacket a standout, but in the time frame given I'm OK that I didn't. @NGLaLaLa - Thank you, it was good to be home for a few days. I was so relieved that he liked the costume. He wore it all day! @Violet - Our local Halloween shops get picked over pretty well by Halloween day. I have made the mistake of waiting till the last minute and walked out of the shops empty handed! @frogginette - Yes, coolest mom ever, I agree! :D Hahaha. @Jessica - You said it, girl! Not a necessity. I like to think it does me good to fly on intuition every once in a while. 1. Go to your Blogger Dashboard and, along the top of the screen, click on Create a Blog. Do all the things you are asked to do, like pick a name for the blog, etc. etc. 2. After you've created the new team blog, go back to Blogger Dashboard, and for your new blog, click Settings. 3. Click Permissions, then Add Authors. You will only need to type in the email address for the people you want to invite to become blog authors. This is great, especially bearing in mind your time constraints. I would have loved to have seen this before haloween. I like that mantra - meticulous when it counts, otherwise fly by the seat of the pants! I subscribe. and you always come through in a pinch. Sewing it this way does make it lie flatter. However, I'm working on a V-necked tee now and I couldn't figure out how to sew it flat. Oh well, I rarely make v-necked ones anyway.